Nature always has a significant role in most favorite and pivotal life moments. On Monday, the cosmos came together to make another one happen…the total solar eclipse! Eclipses are not something that have ever been on my radar, though I soon learned that tons of people in my area had had epic eclipse plans for years! Also, being an Eclipse Chaser is a thing. So…#lifegoals. Once the eclipse was on my radar, I was surprised to learn that my parents already had plans to travel to THE PATH OF TOTALITY. Totality means that the moon completely blocks out the sun, making it so dark that it looks like nighttime for a few minutes or seconds, depending on your location. Lucky for us, the center of the path (AKA the longest total darkness) was only one hour from me and where my parents would be vacationing in Montreat. My sister made a last minute decision to join and it became a full family affair! This cool Nasa video shows the path of totality, in case you were under a rock this week! Leading up to Monday, the news was warning everyone that our area would run out of gas, that the highways would be so backed up that folks should be prepared with water, food, and maps due to over-taxed cell towers. My inner girl scout kicked in and I packed a couple gallons of water, lots of sun protection and SNACKS. There were so many places to view the Eclipse, including parts of the Blue Ridge Parkway, camping spots, and even where we got married! But my parents had planned to go to Greenville, South Carolina to the Furman campus where they met and lived the beginning of their married life! We began our trek at 9 in the morning for the 2:30 pm event, and had no traffic issues! 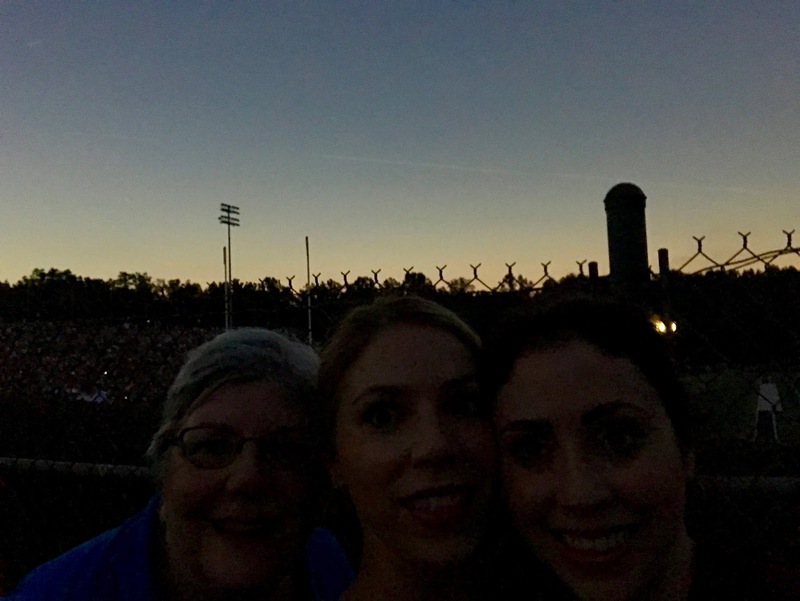 Luckily we were able to snag a shady tree spot outside the metal-sweat-trap stadium where the college put on some performances and the physics department narrated the changing sky. It was ungodly hot and we were so lucky to grab a shady spot with our chairs, blankets, and cooler where we could see and hear everything. We spent the day following the shadow, sweating and chasing hot babies with a screen screen bottle until around 1:30 pm when the moon first touched the edge of the sun! The ‘eclipsing’ hour was spent periodically tracking the path of the moon crossing the sun through our super cute eyewear. As we got close to 2:38, our totality time, the energy totally changed. The light was reminiscent of the ‘golden hour’ right before the sun sets when everything feels dim but glowy at the same time. Know what I mean? When it finally got dark…I couldn’t believe how bright the ring of light around the moon was. That, I did not expect! We spent the next two minutes bumbling around like idiots, trying to take pictures and staring at each other. I regret wasting time on silly iPhone pics when I should have been focusing on the sky, but it is crazy to see now how dark it really got. What you can’t see is the dramatic temperature drop which was so welcome on this 90+ degree day. I had never considered how quickly 2.5 minutes would pass!! It was such an intense experience, I wish there had been a moment of silence or some sort of reverence. That said, it was totally crazy and really cool to experience with my whole family (minus my bride who couldn’t take the day off work). We were really fortunate to have had great weather and a clear view, so that was the trade off for being surrounded by thousands of people. Lots of people who went to the mountains had clouds and rain! Also, the Furman band played the Stars Wars theme song as the full eclipse was completing, so there’s that. Crazy moon-shaped shadows, made by tree leaves! We ended the day racing back to Black Mountain for the last reservation spot at the Red Rocker Inn. If you are ever in Montreat/Black Mountain their food is incredible! It was a fabulous celebration of a really cool day. Hope you all had a memorable Eclipse day! Next Post Baby E is ONE!